how to import BPMN file into modeler? I don't have in options. Am I missing something? BPMN inclusive gateway - one path always fires, other conditional. How to model? Read more about BPMN inclusive gateway - one path always fires, other conditional. How to model? BonitaSoft 5 and 6 - Start of BPM process - in lane or start element? Subject: Why the process-lane-form and getting rid of 'start case' button? 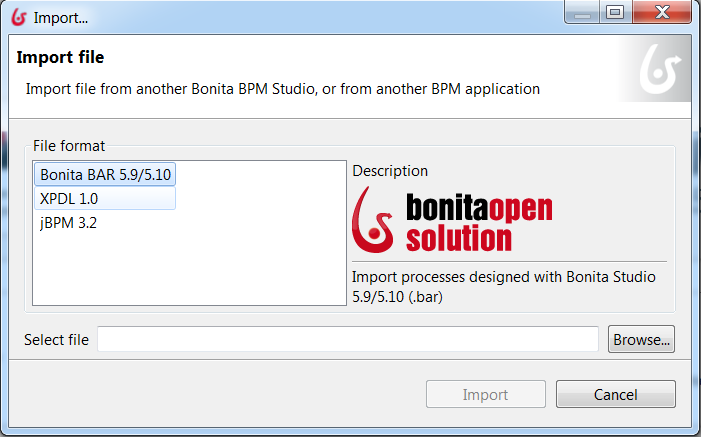 Read more about BonitaSoft 5 and 6 - Start of BPM process - in lane or start element? I am heavily using the bonita export to bpmn files in xml format, and i am missing some parts of the modelled process in this xml. 1. In Bonita Community I am able to set the actor of an activity as "use actor from lane". I cannot the the link between the lanes actor and the activity within the exported bpmn file. Is this not part of the standard? 2. When I set any priority to an activity this will also not be in the exported xml file. Is this not part of the standard either ?